Maintenance Free Outdoor Living in Greensboro: Truth or Legend? I am sorry to have to break this myth. What homeowners wouldn’t love a completely care free outdoor lifestyle. Unfortunately, there is no such thing. The good news is, there are decking and other building materials available that do not require staining or sealing or even power washing. These products simply need occasional cleaning to wipe up anything that falls on, leaks on or splashes on them. Synthetic decking, railings, trim & porch materials are perfect for a worry-free investment. Are you willing to perform maintenance on your deck or porch annually? If your schedule doesn’t permit, or you just don’t want to do it, low-maintenance materials are for you. Few people want to spend a weekend sanding, staining or sealing their deck when the weather is telling them it’s time to go golfing or drive out to the beach. With AZEK and other synthetic decking brands you can enjoy the beauty of your deck with relatively little work. Should a spill occur or leaves sit on the decking for a time, a quick spray with the hose might be in order to keep it looking nice. Whiffle balls, furniture and other kid’s toys won’t hurt a thing with the durability of synthetic decking materials. You’ll never have to worry about splitting or cracking or weather damage. No staining. No sealing. No worries. On the off chance a stray hammer, chisel, axe or other sharp tool has a run in with your decking, a repair might be in order. Your low-maintenance deck will not be very low-maintenance if you have to stain & seal railings or posts. Low-maintenance materials are available for railings, post covers and other areas around your deck or porch. Now you can build your porch or deck with wood columns and wrap them with low maintenance materials for a gorgeous look. With so many options for low-maintenance outdoor living, you won’t have to worry about your railings, posts, columns or decking. In addition to the low-maintenance products provided by companies like AZEK, Trex, Eze-Breeze & Deckorators – you also gain additional protection from amazing manufacturer warranties. 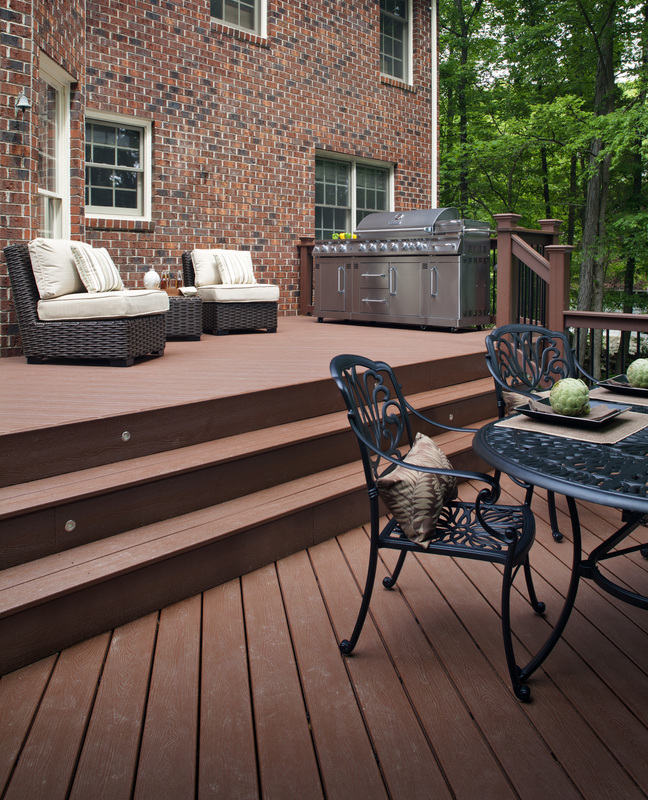 Low-maintenance decking provides a 25 year fade & stain warranty. Eze-Breeze safeguards your investment with a Lifetime Limited Warranty. While Dekorators provides a 15-Year limited warranty. All of this, plus Archadeck’s 1 year workmanship warranty & 5 year structural integrity warranty means you won’t have a thing to worry about.